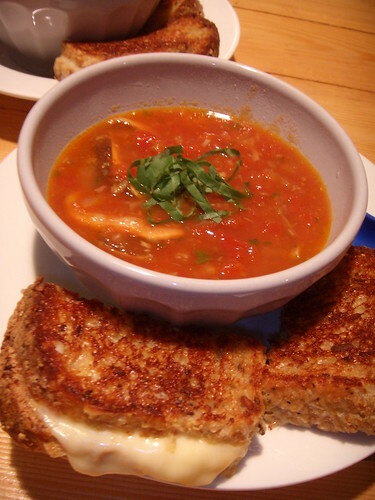 fresh tomato soup and grilled cheese, originally uploaded by aarn! +20th April, 2008+. made a tomato soup with a big can of plum tomatoes, garlic, onions, fresh basil, bay leaf, chicken stock, oyster mushrooms, and honey. served it with some grilled cheese made with "bom petisco" semi-soft portuguese cheese, on a gritty six grain and pumpkin seed bread.